Of all the rooms in your home, the design of your kitchen is perhaps the most crucial to get right. In addition to choosing fixtures and fittings that reflect your taste and suit how you will use the room, it is also important to install an efficient heating system to create a warm and cosy space. Warm water underfloor heating (UFH) is an invisible heating system that is ideal for kitchens where wall space is often at a premium, particularly if you have bi-fold doors. UFH works best when the interior design is reflected in the UFH design – read our top tips for getting the most from UFH in your kitchen. Good UFH design will take into account the position of your fixed and portable kitchen units. Warm water UFH works by pumping a controlled flow of warm water through tubing embedded in the floor, warming the surface of the floor above it. This emits an even, gentle heat into the room. Anything that is directly above the embedded tubing – including your kitchen units – will be warmed by the UFH. This doesn’t cause a problem if you are not storing food in your kitchen units, and a tube layout that runs around fixed units (rather than under them) will ensure that the temperature of designated food storage areas is not affected. However, if you have portable units and islands, or are considering changing the layout of your kitchen in the future, it is best to run the UFH tubing across the whole floor. This avoids the risk of resulting cold spots where your units used to be. The base of your kitchen units can easily be insulated to ensure that their contents are not warmed. Hard floor coverings such as tiles and engineered timber are a stylish and practical choice in kitchen areas, but they can feel cold underfoot if they are not paired with a suitable heating system. UFH delivers an efficient, even heat across the entire floor, and is compatible with a wide range of floor coverings, including engineered timber, tiles, vinyl, laminate and polished concrete. A floor temperature sensor can limit the heat output from the floor to protect sensitive floor coverings. If you are planning to retrofit UFH into your existing kitchen, you’ll be pleased to hear that there is no need to dig up your floor! UFH can be fitted directly on top of an existing floor to minimise disruption to your fixtures and fittings. Make sure you consider the full height build-up, including any structural decks that may need to be laid over the UFH before your floor coverings can be fitted. Nu-Heat’s LoPro™10 UFH adds just 15mm height build-up and floor coverings can be laid directly on top. Whether you are extending, renovating or building from scratch, contact us on 01404 549770 to discuss the best UFH solution for your property. 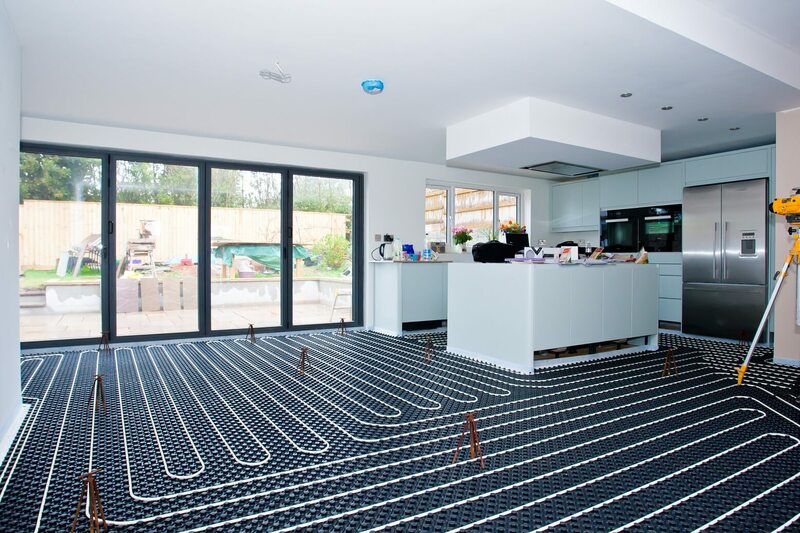 » Find out more about underfloor heating on our website.